Picture from group : Lugnagun from the east. Picture: Lugnagun from the east. 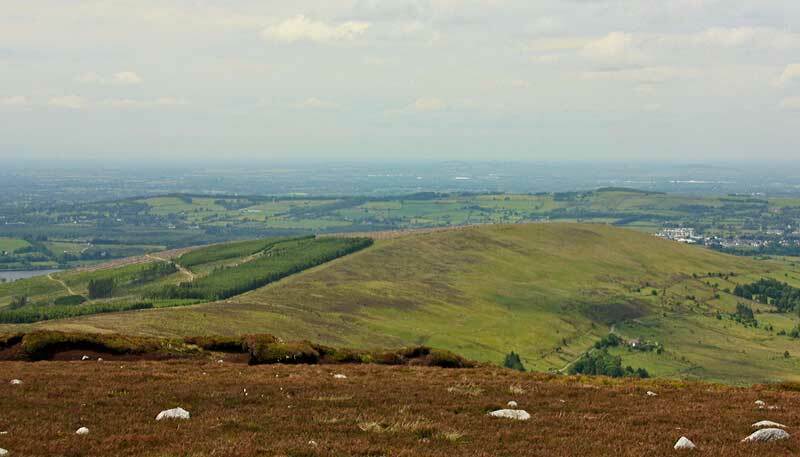 Though not a summit to write home about, it still provides a wonderful grandstand view south out over Blessington Lakes and west to the Hill of Allen. Until recently (2013) pine trees obscure these lovely views from the summit. Now that this area of the plantation has been harvested there is a 360 degree panorama available. Lugnagun is an ideal launching pad for an attack on Sorrel Hill. From Lugnagun summit there is a nice linear ditch feature running south-east and then a relatively good track all the way to the summit of Sorrel Hill. On the way to Sorrel Hill you may wish to visit the remains of a Megalithic Tomb at O02172 11919 A, just inside the forest edge.